To ensure UK delivery on the day of publication, please select ‘Courier’ or ‘Free Delivery to shop’ at the checkout. It is twenty years since the events of La Belle Sauvage: The Book of Dust Volume One unfolded and saw the baby Lyra Belacqua begin her life-changing journey. It is seven years since readers left Lyra and the love of her young life, Will Parry, on a park bench in Oxford’s Botanic Gardens at the end of the ground-breaking, bestselling His Dark Materials sequence. The second volume of Sir Philip Pullman’sThe Book of Dustsees Lyra, now twenty years old, and her daemon Pantalaimon, forced to navigate their relationship in a way they could never have imagined, and drawn into the complex and dangerous factions a world that they had no idea existed. Pulled along on his own journey too is Malcolm; once a boy with a boat and a mission to save a baby from the flood, now a man with a strong sense of duty and a desire to do what is right. Theirs is a world at once familiar and extraordinary, and they must travel far beyond the edges of Oxford, across Europe and into Asia, in search for what is lost – a city haunted by daemons, a secret at the heart of a desert, and the mystery of the elusive Dust. The Secret Commonwealth is truly a book for our times; a powerful adventure and a thought-provoking look at what it is to understand yourself, to grow up and make sense of the world around you. This is storytelling at its very best from one of our greatest writers. Early opening and breakfast treats to celebrate the launch of Philip Pullman's latest Book of Dust title. The Secret Commonwealth Release day! Extended opening hours for Philip Pullman's new book! Philip Pullman's Book of Dust Vol. 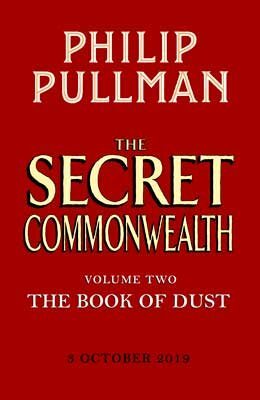 2 'The Secret Commonwealth' is out today!